Seven years ago, as a naive content marketer with more enthusiasm on my resume than actual experience, something transpired that bugged me for years. I was working as a freelance blogger, paying my way through college. A typical morning involved writing, publishing, and scheduling social media content and blog posts for clients. My weekend had been relaxing and my Monday morning coffee was just about perfect. Then it happened. Someone said they hated my blog post. What was even worse? They said I couldn’t write worth a lick. I was stunned. Shocked. Discouraged. It surprised me so much that I couldn’t even formulate a response. Today I wouldn’t think of ignoring negative feedback. 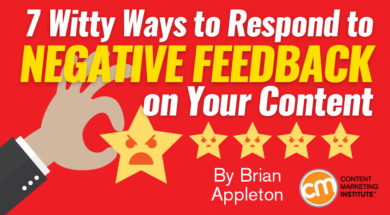 Responding to negative feedback is one of the best ways to showcase your brand’s personality. All you need is a little creativity, honesty, and a solid grasp of the facts. It’s known as wit – the ability to think quickly, often associated with humor. Here are seven tips I use when responding to negative feedback that enable me to strengthen the audience relationship and show off the brand’s fun, professional personality. Every time I read a negative comment, bad review, or insulting remark I take a long, deep breath and read it again. The temptation is to reply immediately to counter all the horrible things being publicly posted. Responding in the heat of the moment always makes things worse. Take the time to consider your reply and don’t jump to conclusions. First, consider the context of the complaint and then formulate a response. If you’re good at humorous writing (or have a co-worker who is) use that to your advantage. Responding with authentic humor is one of the best ways to defuse a tense situation. In the same way that a smile relieves tension in face-to-face encounters, tasteful humor can turn a bad situation into a great one. 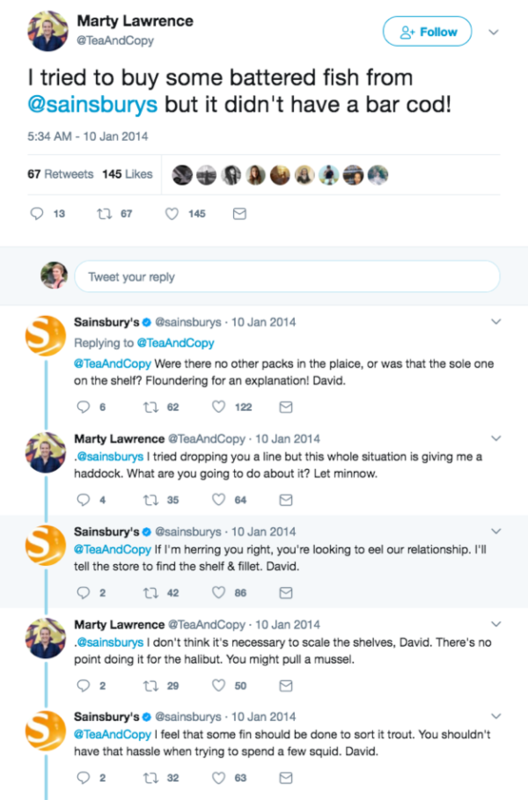 That’s exactly what Sainsbury’s did when it turned a customer’s clever but frustrated tweet into a viral brand win. It’s easy to think your first responsibility in responding is damage control that appeases the commenter. While you absolutely need to resolve the situation, your first responsibility is to your audience and your brand. Let me clarify. Your target audience only includes people with the potential to turn into paying customers and brand advocates. In other words, focus on people who could become qualified sales leads. If the commenter isn’t part of your target market, don’t go overboard to appease him or her. Instead, address the issue and showcase your brand’s personality. 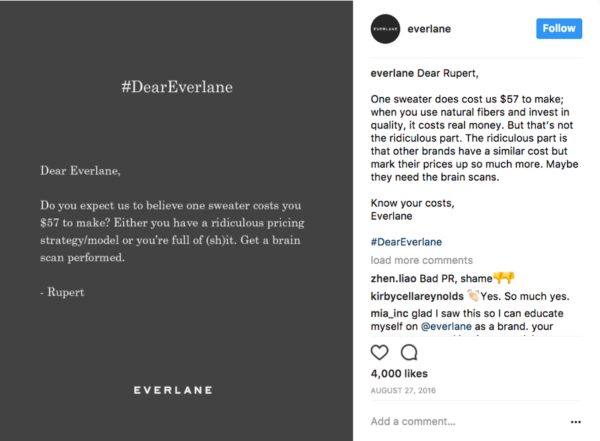 Everlane registered a win after sharing a classy but funny response to a brutal customer complaint on Instagram. Never reply with a general statement. That’s a recipe for frustration. Your response needs to be customized to address the concern. You can always tell when someone is using a copy-and-paste response rather than writing a personal message. Needless to say, this infuriates people. 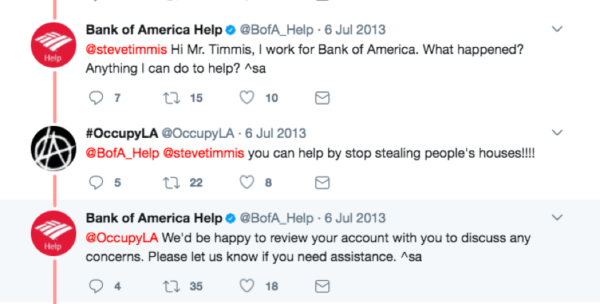 Remember what happened in 2013 when Bank of America used a bot to generate automatic Twitter responses? Rarely will you be able to reason with any one of these three aggressors. 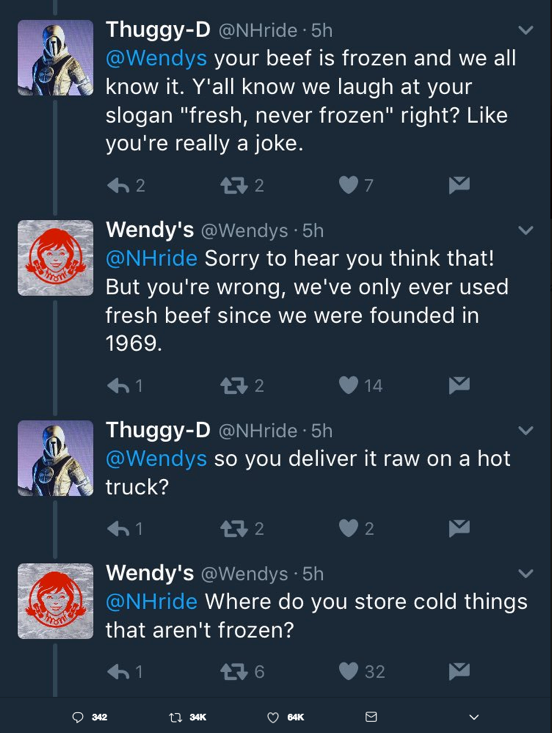 If that’s the case, see if you can (1) hide or delete their feedback or (2) sharpen your wit and create a moment your ideal audience will enjoy … just like Wendy’s did. It’s not always clear why negative feedback occurs or what the real issue is. When this is the case, your best approach is to make sure you understand the spirit in which the original message was intended. Was it hostile, confused, humorous, or frustrated? Once you think you understand how the message was intended, you can craft an appropriate response. 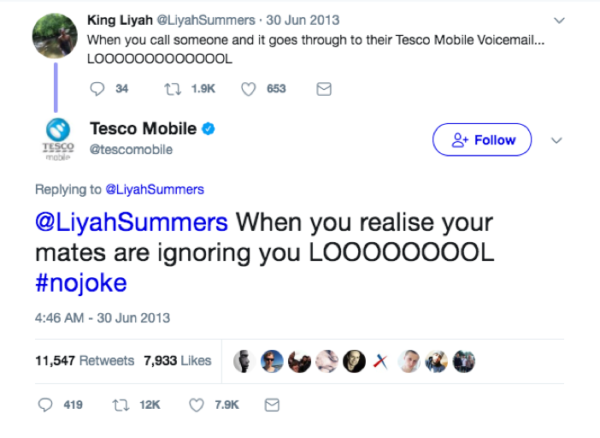 In 2013, Tesco responded to a Twitter user that tagged its account in a joke about a friend’s mobile voicemail. While Tesco’s response might seem rude or insensitive to some, it ultimately resulted in a playful exchange that promoted a positive brand perception. All because Tesco considered the intent of the message. Turn a negative into a positive by changing the narrative and owning the experience. 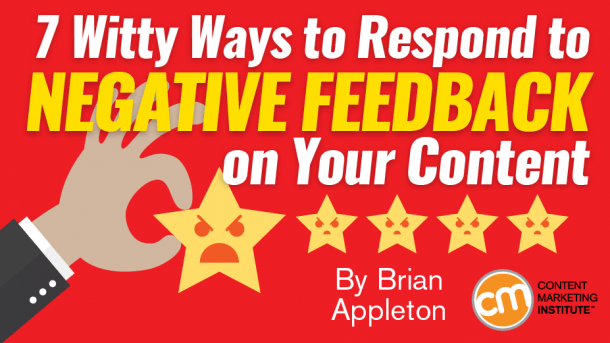 You don’t always have to say “sorry,” ban an offensive comment, or write a lengthy response. Sometimes you just need to own it and unapologetically laugh about it with your audience. Be true to your brand’s personality. Banning someone or hiding a comment should be a last resort. Try your best to reach a peaceful resolution in a way that preserves brand integrity and addresses legitimate concerns. 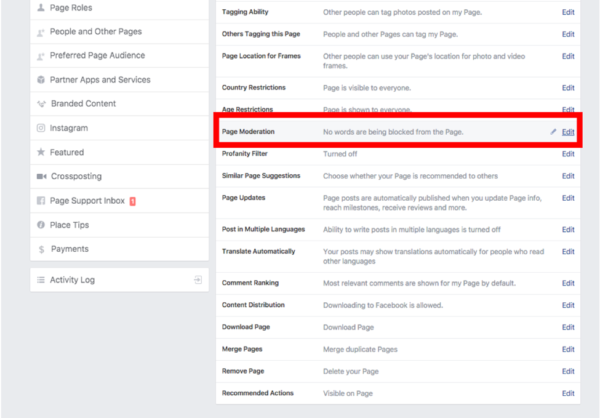 Hide or delete derogatory language and offensive terminology. Respond to the original poster by asking them to privately message your brand to resolve the situation. Ban the poster if they ignore you and continue posting offensive comments. TIP: Ensure that your steps to dealing with offensive language are known to your audience by publishing them in your guidelines. It’s helpful to post those before a potential issue arises to avoid looking reactionary. It’s always best to anticipate problems and address potential concerns before your content goes live. Avoiding unfavorable criticism is impossible if you consistently publish and share content over an extended period. However, you can minimize the damage with a witty reply that both satisfies the commenter and enhances brand perception. 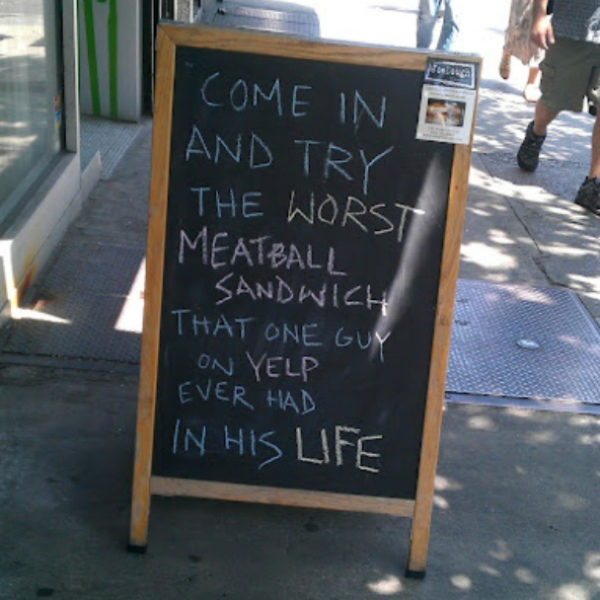 Negative feedback is better than content obscurity. The goal of every interaction is to improve brand credibility and perception. Always stay true to your brand’s personality. Stay connected for the positive and negative of content marketing. Subscribe today to the daily or weekly digest newsletter.